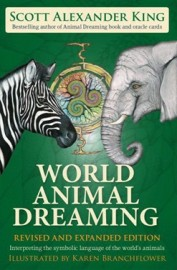 World Animal Dreaming - Revised & Expanded Edition by Scott Alexander King. With 12 additional animal messages and a new chapter on honouring the spirits of deceased and ‘road-kill’ animals, the REVISED AND EXPANDED edition of WORLD ANIMAL DREAMING offers messages and illustrations of approximately 350 of the world’s most exotic species. Listing hundreds of ‘wild animals’ such as Elephants, Lions, Bears and Tigers, World Animal Dreaming is a spiritual field guide that offers insight into how to live a good, healthy and whole life. The purpose of this book is to be used as a spiritual field guide to help you find your totemic animal, unlock your creativity and potential. It may also help you find your true vocation and calling, gain insight into your hobbies and health, relationships, legal issues, death, sexuality, spirituality, religion, education, wisdom and travel, your life purpose and sense of personal power.